Non-executive director Catherine Walter shares her experiences with the alumni seminar audience. 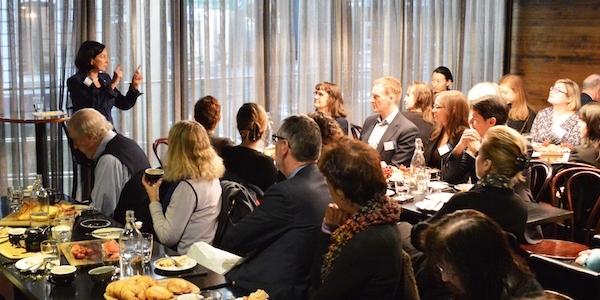 Speaking at Melbourne Law School's alumni seminar on Tuesday, Ms Walter said fundamental skills used in the legal profession, such as playing devil's advocate and seeing the flaws in an argument, would greatly assist those making the transition to directorial roles. "As a lawyer, you are bringing a whole suitcase of skills to the role," she said. Ms Walter is currently Deputy Chair of Victorian Funds Management Corporation and Director of Australian Foundation Investment Company, the Reserve Bank's Payment Systems Board, VicOpera, Walter & Eliza Hall Institute of Medical Research and Vic Forests, and was previously a director of NAB, ASX, Orica and Melbourne Business School. The former corporate and commercial lawyer was also once managing partner of Clayton Utz's Melbourne office. She said the best way for those working in the law to get experience as a non-executive director was simply to do the job, and starting with not-for-profit organisations was ideal for those with a passion for the sector. "To make the transition from practising lawyer to full-time director, do it incrementally," she said. "I am often asked if a not-for-profit is a good starting point. It is, but you need passion for the sector as it's a real commitment," she said. Ms Walter said it was important as a non-executive director to remember that the role is different from that of an executive and to "not cross that line and start telling people what to do." "Sometimes, it's worth thinking of the role as one where you need to influence without power: if you don't win management's hearts and minds, they may not implement over the longer term the desired cultural or other change the board is seeking," she said. Other challenges those on company boards faced, whether lawyers or not, were expectations from the public which could be at odds with the board's actual sphere of influence. But pursuing a portfolio career was a lifestyle Ms Walter said she thoroughly enjoyed. "When you leave a comfortable place, such as the law, you are inevitably taking on challenges. There is an exposure issue in the board world that there is often not in the law world," she said.